Show your Rottweiler › Rottweiler Klub of North America Inc. Learn from Judges who are breed specialists from around the world. All dogs are critiqued and rated according to the FCI breed standard. Awards are given for placements of 1-4 in addition to Class winners, BOS and BOB winners. Our show class structure is modeled after the ADRK. 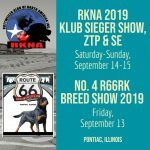 You do not have to be a member of the RKNA Inc. to enter our events. If entering the Champion or Working Class you must show documentation such as a scorebook or certificate.